For this review, I am adopting a different style altogether; the reason is that the book is so wide and comprehensive, that I freely sumbit that I cannot do justice to the entire content in a review – at least, not in a fashion that will hold the readers” interest. That would require in-depth knowledge – and I have only read the book one-and-a-half times. Further, it is also a fact that this is a book that is experience-based, so let me quote practical real world examples based on some of the concepts the book mentions… that should convince the reader to procure a copy. Translation: A sweet sleeping child, face strewn with tears, lies sleeping on the bed; this is a daily affair – how do I say sorry to you, my daughter? This is not something new, it is a daily affair… I always see you sleeping, and take you in my arms in with you in your slumber… how do I explain to you, my child, the story of your overworked and dog-tired Dad? Translation: Whenever I stay late in the office, my head swimming with the pressure of my daily chores, the hours passing by at a terrifying speed – with me unable to ever raise my head from my desk… how do I explain to you, my daughter, that at such times, tears clog up my eyes whenever the memory of your tearful face swims before my eyes? The scenario of the employee as a human being and not as a resource is one of the first chapters in the book – and most of us, with business or professional experience has either experienced this first-hand – or have seen it up close and personal. Job performance is a function as much of KRAs and targets and goals as it is a function of the individual human being who is responsible for setting the strategies and executing the tactical plans. The moment you look at it from this perspective, a whole new business paradigm unfurls in front of view. And at least a few of the top successful people do realise the virtues hidden in this approach. I recall an interchange with my boss a few months ago. He called me up to set up a team meeting. Then he said – dont worry. No plans – just an open discussion. I just wanted to check how much your teams believes in our product, how much they themselves trust and like our product. This is another concept that the book introduces – one that is not touched by contemporary western management science – but it works wonders in the field – simply because an employee who believes in the value and quality of the product of his company will be far more convincing in his customer (whether internal or external) meetings, will more readily recall details and will be more effective as a result. The book talks about to vision and mission statements of the organisation… and makes the solid point through a powerful diagram which features an employee hard at work, focussing on his KRAs… but in the thought balloon, he is shown as thinking “whose vision? Whose targets?”. So true, and so spot-on. Vision statements are in reality just phrases adorning corporate – and at the most – hub offices; on-ground reality has little relation to, or at best little focus on the vision statements, company goals, targets, etc. It is all about my vision, my targets etc… little effort is made to communicate and align the employees with the organisational objectives, to understand individual needs and motivators and align them towards a greater common goal. The net result is that frequently, the larger loftier vision or organisational goal gets lost in the race to achieve personal targets – which is quite often at the cost of long-term sustainability for the organisation. One of the most powerful parts of the book is the one which concentrates on the individual, and how to understand each employee, and the need for getting to know the drivers of each employee. In my own team, I have three people who are poles apart; their motivators are varied. One is driven by money and the will to succeed after a fall; another is just biding time as he is assured of a good job in the government. I cannot drive both by the same logic; as a leader, I need to understand the person – not the resource; the human, not the object on an excel sheet that contributes to my own excel sheet of performance! I could go on and on ; but this is a review – not a sermon. My objective above is to kindle the thought processes of the readers of this review. The above practical learnings and examples should make the content approach of the book clear. The most interesting aspect is that this is not done in the form of a boring classroom lecture, but through learnings from our scriptures – The Vedas, The Upanishads, The Ramayan, The Mahabharat etc. Allegorical stories and the teaching method adopted; each story is short, fun to read and highly interesting – encapsulated at the end is the short business lesson in the form of diagrams and business examples. The writing is simple, the language is very easy to understand and the pace is almost frenetic; it is a page-turner, It looks at the individual, as I have shown above; it looks at decision making skills, It looks at change – both calm change as well as sudden violent change; It looks at the organisation as an organism – in short, it looks at the entire spectrum of business activities. 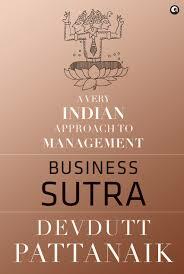 The book moves smoothly from the broad vision statement of the company to its internal organisation and to the individual in a smooth flow. All along, it leaves insights and deep thought provoking germinating ideas in your mind; for example, the segment on the leadership styles and qualities is worth a book unto itself, so powerfully phrased is the presentation. But most importantly, the key message is the importance of the individual as a human being – not as a resource; understanding him / her – drivers, motivators and how these interplay with the larger corporate scenario; how his/her decisions impact the scene; how differing roles are played by various players in the world – the person who makes decisions, the follower, the leader etc. Read this book for this alone; to me, this has been the most powerful learning. tujha jagatun baba harvel ka ga? babasathi yeil ka pani dolyamadhe?…. Translation: What kind of a father has God given you? Goes early, comes late? Your childhood passed without Dad being a part of it; Will Dad be a part of your later life? Will you remember me when I am old? Will you cry for your Dad, for missing him as a part of your life when you stand at the threshold of our house on your wedding day, as you leave forever to your Husband’s house? The most important decision of our lives – the career choice – is frequently the one which gets the least serious in-depth thinking and analysis. There is a tendency among youngsters to follow the trend; or do something because everyone is doing it. This includes the MBA degree, Medicine – or whichever field you can think of. Even after you have completed your professional education, little thought is given to which organisation, or which specific work-field to go into. Yes, some people do give it deep thought and choose something they are passionate about, or talented at, or which suits them. But quite a few dont. This article is meant for those who dont. First, in my 14 years work experience, I have noticed something – and that is the unfortunate fact that earning money has little provable relation to doing something of your choice, or having a career that you are happy at. Innumerable employee satisfaction surveys have proven that most people are unhappy at their jobs; there is little work satisfaction. Paradoxically, most of these ladies and gentlemen are also earning good money – or at least enough money to afford a decent lifestyle. It isnt about money; the human mind,with its untapped and little-understood capacities, can overcome obstacles and force the body to perform, thus ensuring that job requirements are met. But this is an adjustment; it has its costs in terms of health – physical as well as mental. It is possible to train your mind and body to do something you are not interested in; but with the passage of time, dissatisfaction at your daily routine creeps in. The practical needs of providing for self and family ensures regularity and performance on the job – but your mind is increasingly at odds with your reality. This has its tell-tale effects on your health as well – as can be seen with the rising incidence of lifestyle diseases as well as high Blood Pressure, Diabetes and Heart ailments. Yes, it is true that not all dissatisfied people get the above diseases – there are other causes for them. But even if you escape these diseases, the sceptre of dissatisfaction leaves you with a feeling of yearning, of a lack of something vital in your life. You dont enjoy your life and your job as much as you could have; your job becomes a mere tool to provide for your family. There is also another side to this – a bad career choice can lead to failure as well. This does not mean that you as a person have failed; just that you attempted to do something that you are not good at, or talented at, or interested in. Life can become a struggle for such people. That is why focus and attention needs to be given to oneself and one’s abilities at the right stage of your life – and that is during higher secondary school, or during undergraduate studies. The greatest obstacle in front of students in this endeavour is the students themselves; the total lack of interest in reading is a fundamental obstacle that will need to be overcome. Reading keeps you aware of latest trends, developments as well as exposes you to new career choices; it gives you ideas as well as develops your mind and enables an analysis of the self. Apart from this, students tend to disregard elders’ opinions. You as a student need to broaden your horizons, to make you better aware of the world around you and the options it offers. Taking this up with your peers, seniors and elders in the know will only broaden your horizons, expose you to new ideas; you dont have to accept everything they tell you. The decision is yours – it has to be yours. And to make a decision – you need information – which can only be garnered by the means stated above. There is realisation in the West that Pakistan is using its ISI to undermine the Afghan situation; this is an open admission. Even the BBC has openly stated in an article (I dont agree with the contents stated therein in many instances, which is why I say “even the BBC has acknowledged the Pakistani hand”) on militancy: Kashmir militants give up fight and head home. Yet, no one seems to have done anything concrete about it. We have lost over 20,000 lives in 47000+ incidents, and no one in the West cared enough to do anything about it. And yet, the moment the ugly reality of terrorism touched Western – and especially US – shores, we see a sudden interest in the corridors of power. Why, may I ask? Is the colour my countrymen’s blood any different than yours? Is it that I am Homo Neanderthalensis, and you are Homo Sapiens? Am I not Human? We have lived for 66 years (as a nation) with – quite literally – a knife to our throat. And for the past 25 years, that knife has been drawing blood from our neck. And yet, nothing. No acceptance in concrete terms of this reality. And, wonder of wonders, the moment the threat comes home to Uncle Sam and the West, the perpetrator – Pakistan – becomes the state at the forefront of the fight against terror; more funds and arms pour into Pakistan; it is eulogised by one and all for its “sacrifices”… while my India continues to bleed. Thank you, Uncle Sam. What a great friend you are. India is indebted to you. Did it not occur to any of the gentlemen over there that all they had to do was to pressurise the Pakistanis into closing down the Kashmiri militant training camps? But no. Why should they? Indians arent human beings. We dont belong to the species Homo Sapiens, now do we? Yes, yes, yes, yes, and another yes – I am aware that all those Pakistani geniuses (and they are geniuses – smarter that those US greats, at any rate; look at how they have been fooling the USA for all of 25 years) – as I was saying, all those Pakistani geniuses had to do was to shift the location of the camps. But, my very dear american friends, it would have driven an even further wedge into the Militant – Pakistani relationship, as well as brought India closer to you than ever before. But then, why should you? It isnt your blood, it is ours. You might say that the above step would only serve to drive the monster against its creator Pakistan. To that, my take is: Ya, Right. A dead Indian is anyday better than a dead Pakistani, isnt it? Well – not from where I stand. Sorry, but cant see it that way… Indians prefer to live, thank you very much. And then what do you do, to top this all? This: “In secret negotiations, the terms of the bargain were set. Pakistani intelligence officials insisted that they be allowed to approve each drone strike, giving them tight control over the list of targets. And they insisted that drones fly only in narrow parts of the tribal areas — ensuring that they would not venture where Islamabad did not want the Americans going: Pakistan’s nuclear facilities, and the mountain camps where Kashmiri militants were trained for attacks in India.” Note how carefully this has been worded, interesting, isnt it? It is called plausible deniability… which is also, by the way, a term of CIA origin. Kudos to the NY Times for highlighting this! Heartfelt appreciation from an Indian Citizen! Thank you, Uncle Sam. Thanks a whole bunch. When will my political leaders wake up? Is this the behaviour of a friend? Of a friendly nation? I dont think so. Strategic Partnership????? Look up its definition, will you, Uncle Sam? I had honestly thought that with US pressure, perhaps Pakistani support to terrorism will decrease. How stupid of me! There are no friends; only interests, That is why I have been stressing strategic partnership in all my US posts. On the one hand, we have USA waxing eloquent on our strategic partnership; on the other hand we have what I have given above. The problem is that the current situation is actually emboldening Pakistan to continue its Kashmir interference. Inaction on that score – calling it to task on its training camps – is actually acting as a catalyst to its activities. There is probably a feeling that no one will do anything against us. I intend to question my political leaders as well: I have just hinted at it in this post, as can be seen in the conclusion. The whole India-USA relationship is cockeyed and topsy-turvy and needs a serious re-think. We need to examine what – if anything – we are getting in tangible terms, aside from rhetoric and FDI. Nothing concrete seems to have emerged as of yet… I shall try to attempt what we have got from our USA relations in a later post. Admittedly, Nuclear Deal, our inclusion in NSG would not have happened without USA – but the rest would happen with or without USA. We are not getting technology, we are not getting clout… nothing. It is a strange, even funny relationship. That is what I am questioning. I am ok if we are using the USA to get what we want; that is smart diplomacy – and given that USA has actually suppplied arms to Pakistan in a clandestine fashion for Afghanistan as well as set up the ISI’s skills – it is acceptable. But I draw the line at a strategic partnership with a nation that has been against us all these years, has been aware of the ISI’s deeds, has introduced ISI to such tactics through its Afghan misadventure and done nothing about it. We have a nation that is aware of our bleeding and doing nothing about it. That doesn’t sound right. If we are gaining something tangible, then it would be ok; but aside from trade – I dont see what benefit we are getting out of the USA. In fact, when the economy is in a better shape, I dont think it a bad idea to give an ultimatum of sorts to the USA – either stop supporting Pakistan in every way, or no deal. On anything. Poverty is a reality that continues to haunt our India, and is showing only very slow signs of alleviation.This is not a question of economics – whether capitalist or socialist; or of systems – whether open or authoritarian. The question is one of morality – and the answer to that is, regardless of economic realities and governmental systems – no, it is not morally conscionable for us to allow over 200 – 300 Million people to live in extreme poverty. It is easy to shrug it off and say “we worked hard for growth, we deserve it”. It is equally easy for the detractors to say “what growth? this growth has come from exploitation”. Neither view is in itself a problem; the problem is, now that you have been made aware of it, what do you intend to do about it? I am not talking socialism; I am not stating capitalism. I am talking about being human. Put up or shut up is what I say. What can you as a person do about it? What can your society do about it comes much, much later… it starts with the individual. This applies to me as well… even I have not gone beyond writing about this : http://reflectionsvvk.blogspot.in/2013/03/the-curse-of-poverty.html. And please dont tell me an individual does not count. Need I remind everyone here of Albert Einstein, Mahatama Gandhi, Martin Luther King, Sachin Tendulkar, VIshwanathan Anand, Isaac Newton and many, many more? Each name an individual from a different field, each made a difference to his field as an individual,. Even Anand, whose success drove the chess revolution in india. Or Tendulkar, who has the power to bring a nation of a standstill. I think we should all stop for just a moment and look inward. There is a lot that we can do as individuals. Within our own society. Like sponsoring the education of a poor child. There can be many, many such initiatives that can be taken, that can lead to good results. Main criticism to this is that this will require time to implement, as getting everyone into this mode will take a generation. And that criticism is, unfortunately, well grounded in fact. But what alternative is there? Anyone have any answers? Capitalism? Dont make me laugh. Capitalism is not a mechanism that is designed to alleviate poverty; it is a ruthless survival of the fittest game. It can deliver excellent market performers; it is the most capable system in terms of efficiency and productivity. But that is about it, On being confronted with a scenario of this scale of poverty, the lowermost sections are always going to lose, Always. The reason for this is simple: capitalism implies certain levels of basic skills; those not in the said skill sets dont make the cut, and get left out. It is simple truth. We are talking about the lowermost sections of society; these people are too busy arranging the next meal to worry about such niceties as education. And even if they manage an education, family circumstances force them out early, so that they can provide for family. Result? These people miss the bus, The capitalistic systems have provided for them – these people are now able to afford 2 meals a day – but little else. Their existence remains hand-to-mouth. And western policies like this one http://reflectionsvvk.blogspot.in/2013/04/disclaimer-i-am-almost-layman-i-have.html dont help much either. This leaves India with 2 choices: acquiesce, or deny, We have chosen to deny. Had we acquiesced, the impact on our economy would have been worrisome, as over the short term, the reduction in subsidies would have hurt the farmers, their families and the food security of the nation hard. Is this so difficult to understand? Why the western insistence on this stiff pre-condition?My point is that such policies further enhance the problem, rather than solve it. The per capita income of the bottom 20% of India’s population has not changed (as a percentage share) since 1978. That means, the bottom 20% of our population has not benefited at all from our economic boom. This is also confirmed by consumption patterns: with the consumption by the bottom 20% of the population being static @ between 0 – 1 growth%, in complete variance with the 3% growth registered by the top layers. While in the 1990s, India’s Gini Coefficient was 0.32, it has now gone up to 0.38. The top 10% now make 12 time the bottom 10% – as opposed to 6 times in the 1990s. Simply put, while capitalism has brought tremendous benefits to the top 20%; as well as sizeable pluses to the next 40-60% of the people, the bottom levels remain unaffected. In other words, the capitalistic model has failed to deliver the needed results. I am not making a case for socialism; it is undeniable that capitalism has brought benefits to one and all in absolute terms. But those absolute terms have proven insufficient for providing a decent life to the bottom of the pyramid. In simple terms, the trickle down effect is way too slow. While it takes complete impact, how many more billions will our society condemn? That is why I say, put up or shut up. I dont have an answer to this problem; in the meantime, I will do all I can – at my own level – to alleviate this,.Given the world economic system today, and given the established fact of socialism’s failure, we are operating the optimal system. But that does not mean that the current system is human. Its established failure to deliver justice to the downtrodden is a matter of documented record… as is the fact of the richer nations doing their best to keep rich – at times denying basic rights to the poorer nations as can be seen in the example above. These things will not change; hence I say – do what you can at an individual level. In simple terms, the USA is not agreeing to allow the smaller farmers access to subsidy in the form of administered purchase prices. If USA has its way, all such subsidies shall be a part of the Aggregate Measurement of Support (AMS). So, the hard data above shows the absolute necessity of support for these farmers. The impact on their earnings, and the productivity levels will be disastrous. Being an agriculture graduate with nearly 5 years rural sales experience, I am also aware first-hand of the status of these poor farmers. But no, the great Mr Sam (Also known as Uncle Sam and The USA) can only see that China might gain. It is the same cold war and the middle east problem in another form – Indian interests do not feature in our – aah – strategic partner – at all. They didnt in 1947, and they dont now. That is the only logical conclusion I can draw from this. If this is a strategic partner, then God save me from my enemies! Thank you, Uncle Sam. But frankly, I am disgusted… and today, you stand alone on this. This proves conclusively to me that Indian Interests do not feature on US’ list. And they talk about a strategic partnership! God save me from my Strategic Partners! It is the same as it has always been – USA focussing on China and Pakistan today, and on Pakistan and Russia yesterday. We have nothing to give the USA except a market. Fine, USA has expectation from us… but remember, we have expectations too. It cannot be a one-sided affair, Mr Sam! Frankly, this episode has left a bitter taste in my mouth… pusillanimous! Disgusting! “I thought India was pretty jammed with poor people and cows round streets, witch doctors and people sitting on hot coals and bathing in the Ganges… but I did not think anybody thought it was important” – Harry S Truman, 33rd President of the USA, around 1951. The above was stated when Chester Bowles requested a posting to India as Ambassador. The comment itself speaks volumes for the US attitudes towards India in those days – please remembiner that in 1951, we were not in the Russian cirde of influence. That started after 1960, and gained momentum only from 1971. The question is why did this come about? Why did the 2 democracies – India and the USA – not get together earlier? For this, we have to go back to where it all started: before independence. It is true that Nehru was attracted by Russian ideals. But can we blame Nehru, who was a slave to a brutal exploitative regime? Would it not be only natural for a slave to be attracted towards a regime which promised equality for all – especially when that slave was reading signs like Indians and Dogs not allowed practically everyday? Nehru;s affliction was only natural. It needs to be noted that despite this natural proclivity towards and attraction for socialism, Nehru et al chose a mixed economy, with emphasis on private enterprise, with the core sectors needed for development being led by Public Enterprises. This is a sign that no one notes – that shows that our leaders were thinking men who were moulding known systems, and trying to arrive at a best fit. Then the Atlantic Charter – when Indian rights to freedom – were denied also played an important in the overall scheme of things. The backtracking by the USA stunned the Indian leaders, and drove a negative image of the USA into their minds. This was a brutal and massive setback of Indian aspirations, and one that cannot be understated. The end of the Second World War brought world to a point where forces were aligned in 2 – USA and Russia. And that is where the the real story starts to unfold. According to US archives, the first message Nehru sent as Acting Prime Minister was on 20 September 1946: “In view of the very serious food situation in India which is being aggravated by shipping strikes in America, would earnestly request you and throiugh you the labour leaders to permit and arrange for earlier dispatch of food ships to India”. . At this juncture, (or few years afterwards), there was no approach to Russia. Indeed, the first Indian Ambassador to Russia was not even granted a meeting with Stalin, whereas there were diplomatic ties with US right from 1946. The first approach was made by India to the USA. The above paragraph proves quite conclusively that the western affliction with Russia far predates our alliance with Russia. It stands to reason that the British, having alluded to US support against Russia, would have discussed this with them. The western preoccupation with Russia is what started pushing India towards the Russians, slowly but surely. As proof, Pakistan joined the alliance in 1955. The Russians, initially cool towards India, also naturally followed the developments, and took advantage. Then came the chance to provide technology to India: in the form of steel plants. This technology was refused – but was given by the Russians, who were quick to spot an opportunity. Further, knowing the pride aspect of Indians, they offered technology transfer as well. The first Military deal was signed in 1962 – with full technology transfer – something the USA is yet to do as of 2013. It also needs to be noted that Indian and Russian interests did not clash in any segment – a fact which holds true to this day. As regards the Russian angle, we were never part of the Russian block. We were just allies. Further, please note that Russia offered technology transfer right from the start; and actually helped us whenever we were in dire need – whereas the USA always denied help – right from the 1930s and 1940s. Documented fact. US denial of help to India right from the Atlantic Charter predated the Indo – Russian alliance. Atlantic Charter, Refusal to give steel technology for steel plants, Military help to Pakistan from 1955 etc etc all predate India’s alliance with the Russians. I dont think the West has any right to object, given that they had refused us help consistently, right from 1947. An American president is even on record stating “I didnt think it (India) was important (as shown above)”. This statement also predates India’s so-called alliance with the Russians. If we went to Russia, it is the west which is responsible for it, with their refusal of help on innumerable occasions as well as building up Pakistan militarily. We had no option; we had to ally with Russia for self-defence. The West had better examine its own actions before preaching to India. The record shows we approached USA first – and were spurned on each and every occasion. The reason is that USA was not interested in altruism or friendship; they needed a means to control the middle east and Russia – and Pakistan met the requirement. The penetration of the English Language is undoubtedly increasing with each passing day; this is driven by the fact that English is the language of international of commerce & science. It is also the language with the widest spread; and is thus the link language between cultures. That is undisputed, and this will only increase at least in our lifetime. The spread of languages is governed by culture and politics both; consider Latin – which was in its heyday enjoying a vast following till socio-politico-cultural changes in the European continent changed that, Or Sanskrut – which was the link language for the entire Indian Subcontinent and some areas in the immediate east: the rise of various politico-cultural changes made first Prakrut, (in simple terms, a spoken version of Sanskrut) and then its various offshoots (the modern Indian languages – esp Hindi predominant). Similar is the case of English; it enjoys the status of the primary link language. It has massive momentum behind it in the form of science and commercial communication, its brand of movies, the lure of the economic might of the west and a vast body of literature to sustain its continued dominance over world affairs at least for the foreseeable future. But every coin has a second side. In the case of English – there are 2 other sides. First is the interaction with other languages, which is showing signs giving rise to what are already being called dialects. At the extreme is the case of the interaction with Hindi, which is giving rise to what some people are already referring to as Hinglish – a mix of the 2 tongues Hindi and English. This is the way languages evolve: Sanskrut led to Prakrut (disputed by many linguists who state they are parallel in emergence), Prakrut in turn, gave rise to Maharashtri Prakrut (among others) – which, by AD 300 – 800, came to be known in its modern form as my mother tongue – Marathi. Similar is the case with all other languages; Hindi emerged out of several languages. Languages evolve – and we can see this happening already, as British, American and Indian English are already known to be quite different. As to in which direction they will evolve is anyone’s guess. The survival of languages is a function of the number of native speakers of the language; the smaller numericals do tend to get subsumed into the larger numbers. Not talking about English here; the absorption is typically into allied related tongues- for example, Bhojpuri into Hindi. Tamil will never be subsumed by Hindi – or HIndi / Bhojpuri into English. The vast difference between the 2 tongues would preclude such a possibility. It is easier to adopt a relatively familiar tongue – and it also gives rise to less friction. The friction and the cultural backlash when a language begins to threaten another is a reality when the subsuming tongue is perceived as alien. I would love to know if there is any evidence of the reasons of the depletion of languages being due to English. It seems to my untrained (but hobbyist) eyes that the real threat to minority languages is from the related tongues. The only caveat is the political factor. That would seem to kill languages, that seems true, But, if you consider Persian – which was the political tongue in India for nearly 5 centuries – that complicates matters. The moment it lost patronage, it vanished within the space of a generation. Thus, while the political factor is important, it seems to me that the presence of indigenous literature, art and culture in the said language is the real factor behind the sustenance of languages. Example – Sanskrut, While there are no native speakers anymore, the vast body of literature in it ensures that it is still a live language – at least in the realms of religion and higher studies. Or Marathi – the constant stream of class literature has ensured its continued survival for 1500 years now… The moment literature dies, the language has started to die… literature seems to give a language life; it keeps its adherents glued to it; as does art and cultural traditions. I am sceptical about the effects of globalisation, and the ability of English to overhaul our indigenous linguistic heritage. It is more of a colonial hangover, and is limited in scope to only the top 3-5% of native speakers; the rest still use their respective vernacular tongues as a matter of course. With only a penetration of a few percentage points, we are already seeing a massive cultural backlash in India at least, targeting western customs that are seen as non-Indian in nature; as well as promoting Indianness and Indian languages. On the positive side, more and more youngsters are going the culture way, and consciously creating an Indian identity for themselves in both tongue as well as appearance and behaviour. Vernacular literature is showing signs of a robust revival, with translations of famed English books into Hindi and other local tongues being available everywhere; the next logical step is a revival of original literature… of which there are signs available. Vernacular literature is still alive in India and vibrant; what is required is popular mass following. The first step has been taken – popular Indian writers like Chetan Bhagat have now started releasing their works in Indian languages. This should go a long way towards bringing in popularity and numbers to the literary landscape. That is why I dont think that language depletion will happen – not in a 100 years, and not in a 1000 even. In India alone, there are 29 languages with over a million speakers, 57 with more than 100000 speakers. And the number is not depleting as per information available to me;. The reason is the cultural backlash that is now raising its head, with more and more people returning to their roots. In this day and age of easy bonding, IT, Social networks, and unhindered information flow – it is easy for people with similar thoughts to come together and for views to find receptive eyes and ears. No people would like to lose their language: when this threat passes acceptable levels, visceral forces are unfortunately unleashed; which is why this cultural backlash is welcome – it is a safe outlet for pent-up emotions. A safety valve, if you will. At least in democratic political systems, I perceive little threat. And in unfriendly systems (with forcible suppression) , the backlash will unleash visceral forces that will be to the detriment of everyone – as we have seen earlier.